State’s infographic of newly designated Iranian-based Bahraini militant, Qassim Abdullah Ali Ahmed. The US State Department announced earlier today that it has designated an Iranian-based Bahraini national as a global terrorist. This comes amidst repeated attempts by Iran and its Islamic Revolutionary Guard Corps (IRGC) to incite an insurgency against the island kingdom, who’s leaders have launched a widespread crackdown on all Shiite opposition. 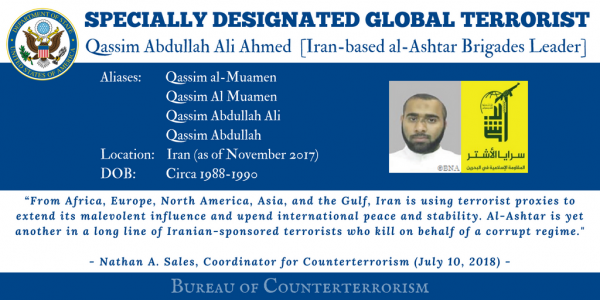 In its statement, State denotes Qassim Abdullah Ali Ahmed, or Qassim al Muamen, is ‘an Iran-based leader of al-Ashtar Brigades (AAB).’ State adds that Muamen “has recruited terrorists in Bahrain, facilitated training on weapons and explosives for AAB members, and supplied AAB members with funding, weapons, and explosives to carry out attacks.” According to Bahraini officials, the statement reads, Muamen was also responsible for several assassination and bombing plots on leaders and oil infrastructure. Muamen is not the first Iran-based leader of AAB to be designated as a global terrorist. Last March, State designated Hasan Yusuf, who was described as an “Iran-based senior member” of the group. AAB has also rebranded itself in which it took on more overt imagery to highlight its connection with the IRGC and Iran’s ‘axis of resistance.” This rebranding was mentioned in State’s designation of AAB as a terrorist organization last month. Bahraini officials have accused the group of receiving training in improvised explosive devices (IED) from the Hezbollah Brigades, a US Treasury designated Iranian-backed Shiite militia in Iraq. State’s designation of AAB as a terrorist organization also noted extensive Iranian support in both weapons and training for the militia, including in Iraq. Additionally, Iran has redoubled sponsorship of militant groups in Bahrain in recent years. Bahraini security forces have intercepted large quantities of advanced Iranian weapons shipments and explosives, including armor-piercing explosively formed penetrators (EFPs). Iran has also buried killed Bahraini militants within its borders, further showing the Islamic Republic’s support of extremists in Bahrain. This relationship is also seen by another Bahraini militia, Saraya al Mokhtar, adopting IRGC imagery shortly after AAB. Since 2015, Manama has detained dozens of Bahraini nationals linked to the IRGC and Lebanese Hezbollah. Bahrain has also accused Lebanese Hezbollah and Asaib Ahl al Haq, another IRGC proxy, of training Bahraini militants in Lebanon and Iraq. That said, Bahrain’s heavy-handed approach and crackdown on all Bahraini Shias, not just militants, only further serves to radicalize more of the populace which plays into Iran’s strategy.